As January comes to a close Tuesday, it’s been a month that’s featured very little winter weather in the Mid-South and more days you’d expect to find in March and April! The same was true today as temperatures soared back into the 60s following a brief cool down over the weekend. With February’s arrival, very little change is on the horizon in our weather pattern, meaning more mild days and just a few chances for rain in the foreseeable future. The first shot at rainfall in the days ahead is just about 24 hours away, expected to arrive late Tuesday night in association with a cold front sweeping in from the northwest. However, prior to any wet weather, another nice afternoon is expected Tuesday as temperatures climb to the upper 60s, though south winds will be breezy as moisture levels increase. As the front approaches after midnight, rain chances will increase, which will continue into much of Wednesday as well. Fortunately, with instability limited and the system expected to pass through rather quickly, most rain should just be in the form of showers. Amounts will on the light side, generally a quarter to third of an inch. The front will clear the area Wednesday night, meaning a return to dry weather Thursday and at least part of Friday. However with arctic air still locked in place well to our north, the mild temperatures will continue with highs expected to remain in the 60s, a good 15 degrees above normal! 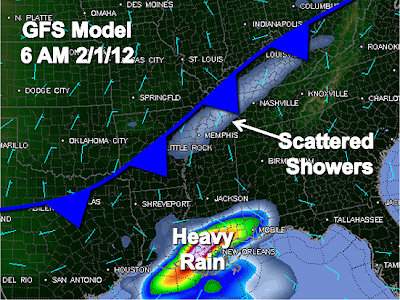 The next cold front is then expected to move toward the area later in the day Friday, providing our next chance of rain. Computer models are somewhat disagreeing with the timing of this next system due to the complex pattern in place, but rain may be possible on both Saturday and Sunday, and details will be refined as necessary in the days ahead. Temperatures may turn slightly cooler as well by next weekend, but any true arctic air still looks to be further out in the month where confidence is dramatically lower. For the complete forecast, visit MemphisWeather.net.